Arguments, fistfights, even death threats--an evolutionary time in rock climbing known as the "hangdog days"
The popular Day Hiking series adds another 100 hikes--this time in Alaska! by Topher Donahue and Craig Luebben. Lisa Maloney has lived in Alaska for more than 25 years. A former hiking columnist for The Anchorage Press, she also covered a nationwide hiking and backpacking beat for About.com, served as a senior editor at Alaska magazine, authored the award-winning travel guidebook Moon Alaska, and contributes outdoor and lifestyle articles to a number of publications. Find her at www.hikingalaska.net; or Facebook, Instagram and Twitter @HikingAlaska. 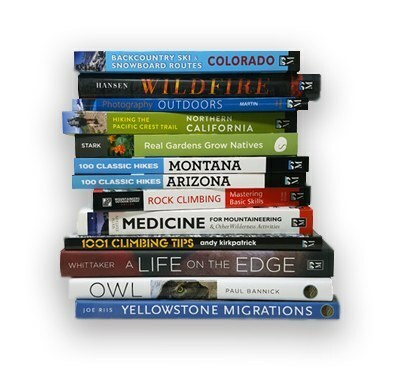 See what just hit the shelves from Mountaineers Books! I'd walk the line... on these routes so you don't get lost! Cycling season is ramping up and we have the books to feed your pedaling addiction (or one you may want to start). Here are some great biking reads. Life is an adventure and it's not complete until we die or give up. Dierdre Wolownick-Honnold, author of "The Sharp End of Life: A Mother's Story," is not a quitter. In her late 60s, she's still having new adventures. Here we learn Dierdre's view on living a life of high standards and big walls. Setting goals is helpful for pretty much anything you want to achieve, and hiking is no different. "Day Hiking: Southcentral Alaska" author Lisa Maloney offers some of her top recommendations for goal hikes to work towards in Southcentral Alaska's stunning natural scenery. Get free standard shipping anywhere in the lower 48 states on orders of $100 or more.